Eastwoods Nursery has designed and is creating these White Oak containers for growing Japanese Maples and other plants of your choice. The wood is harvested locally and sustainably. The planter boxes are designed for the fibrous growth habit of Japanese Maples. They are also suitable for other plants. They are intended and finished for outdoor use. We are currently shipping the planters; please inquire about shipping costs. The 24" container is $295.00; add a tree for an additional $99.00. In some cases a second tree is not only possible but an asset to the whole look. Larger containers are available through special order. Eastwoods Nursery is now offering our poster illustrating the assets of trees from beauty to clean air. 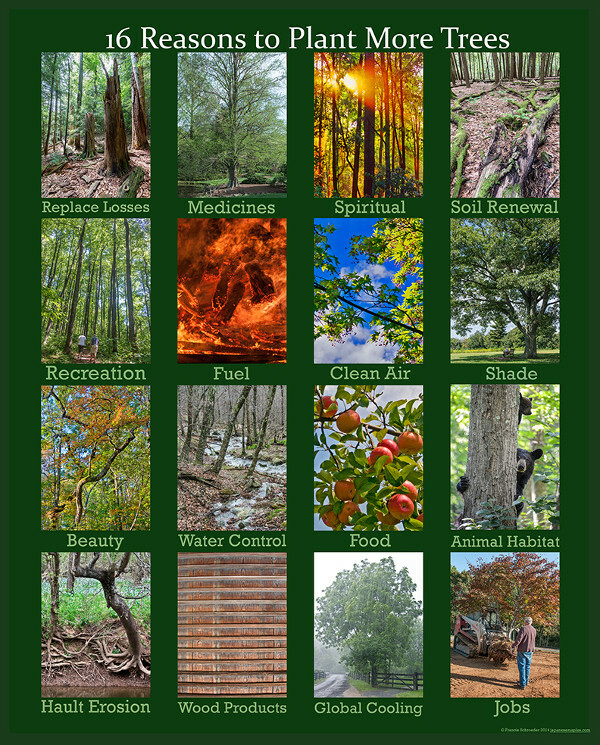 The poster, titled '16 Reasons to Plant Trees', is 20x16" printed on quality paper. It is $19.00 plus $6.00 shipping. 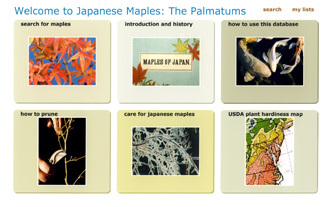 We are very excited to offer our own searchable database with over 1750 photographs of over 470 Acer palmatums on CD. Search by name, size, form, leaf and/or color you desire. Browse the entire index. Create lists. Hear the names pronounced by a Japanese linguist. Print out details pages. Find information on planting, pruning and general care. Check the USDA hardiness zone map. System requirements: CD-ROM drive and hard disk drive. MAC: Apple G3 or higher; 128 MB RAM; OSX v 10.28 or later. PC: Windows 2000; 64 MB RAM; XP:128 MB RAM; Pentium 300 Mhz or higher. Gift certificates available. Charge today and we will send them out tomorrow. Give the promise of spring and warmth of sun in the middle of winter. Also great for Mother's Day and Father's Day or birthdays. Select from one of three options: A) $40.50, enough to pay for one of our $30.00, one year grafts plus shipping to most east coast states. B) $25.00 OR C) $100.00. Options B & C may be purchased singly or in multiples. All orders during the month of December 2012 will receive a $5.00 coupon toward their next order. Welcome to Eastwoods Nurseries on-line catalogue and information center. We are a small, family run nursery. We grow Japanese Maples and a selection of conifers and ginkgoes on our farm in the mountains of Virginia. We supply the collector and connoisseur, the designer, the landscape architect and the everyday gardener with these beautiful trees and the information needed to care for them throughout their lives. Order on line: e-mail your address, phone and selections. We will send you an invoice through Pay Pal. You do not have to be a member of Pay Pal. Make a selection from the choices below or e-mail us for advice. If you are searching for a particular cultivar and it is not listed ask about it. We try to keep the web site up to date not list cultivars we do not have and we do not put people on long term waiting lists. Contact us with specific questions or send $2.00 with your name and address for our catalogue. We mail only the smaller trees, those in 6" and 10" containers, but if you need a large specimen, remember that we have several thousand trees in containers and growing in the fields. We often see people at our nursery by appointment (call 540-675-1234) or during an open house. We will be selling and displaying our unique white oak planters at the Spring Market, sponsored by the Inn at Little Washington, in the town of Washington, Va. from 10:00 till 3:00. This event coincides with Virginia's Historic Garden Week. The nursery will be open for drop in customers, visitors, friends and the curious. We will be open from 10:00 till 4:00 Friday and Saturday and 10:00 till 3:00 on Sunday. 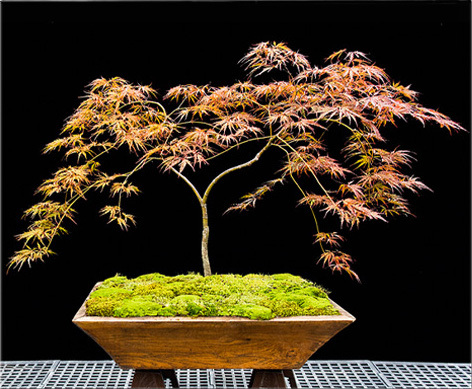 Eastwoods Nursery will be participating in the benefit sale at Green Spring Garden, 4603 Green Spring road, Alexandria, Va. We will be selling our Japanese Maples, Ginkgoes, conifers and very special white oak planter boxes. Rain or shine the nursery will be open for drop in customers and visitors. Bring your garden plans and your questions. There will be signs out on Rt. 211 to direct you. 634 Long Mountain Road, Washington, Va.
You can often find us at flower and garden shows throughout spring. We try to keep the dates and locations posted so you can meet us and see the quality and the variety of our trees. Please note that you can send us a request before a show and we will hold it till you arrive. We are interested in your stories and your questions. Please keep in touch; let us know how your maple is doing. Your continuing success is our reputation.